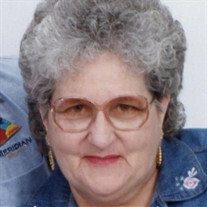 Dottie Elizabeth Mongold, age 75, of Rig, WV passed away on Thursday, February 15, 2018 at Grant Memorial Hospital. Mrs. Mongold was born June 14, 1942 in Rig, WV and was a daughter of the late Glenn Conway Crites and Rebecca Madeline (Baldwin) Crites. In addition to her parents, she was preceded in death by an infant sister, Connie Marie Crites; two brothers, Norman Glenn Crites and Donnie Robert Crites. Dottie was a waitress for several restaurants including the former Sites Restaurant in Petersburg and Ponderosa Steak House in Moorefield, WV. She was a member of Rig Assembly of God Church. Surviving her husband of 56 years, Andrew C. Mongold; one daughter, Connie (Keith) Kelly of Houston, TX and two grandchildren. Seven brothers, Randall (Lana) Crites of Rig, WV; Jeff Crites of Rig, WV, Rex (Elenta) Crites of Rig, WV, Boyd (Neva) Crites of Petersburg, WV, Jerry (Barbara) Crites of Moorefield, WV, Rodney (Shawna) Crites of Moorefield, WV and Steve (Tena) Crites of Moorefield, WV. According to Mrs. Mongold's request, her body will be cremated. All services will be private.